By Fownes. This pattern of 'double-gauntlet' was designed and patented in 1907 by Henry Urwick, son of one of the partners in the renowned Fownes glove manufacturing company. They are designed as a two-in-one glove - the inner one being an ordinary glove made in light tan coloured soft chromed leather with a wide mid-forearm length cuff and unlined five finger hand section. The outer glove shares the cuff section of the inner and is in the form of a fleece lined mitten without divided fingers and without any palm. 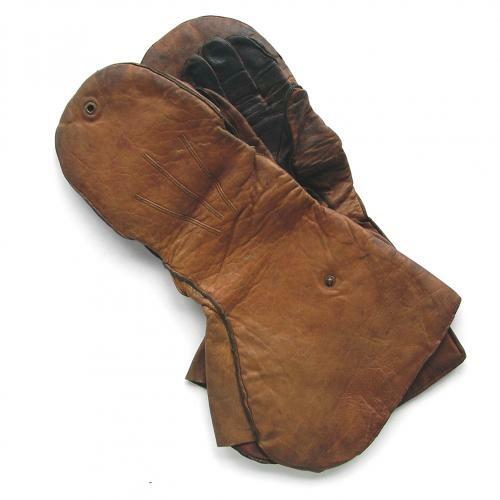 The thumb and backs of the two gloves are sewn together but the fingers are not connected to each other such that the airman could turn back the mitten revealing his fingers whilst still wearing the inner glove. This proved popular with many RFC airmen during the Great War. The leather is in good condition, lovely and supple but soiled, mostly on the palms and inner cuff areas. The mitten sections remain in place and can be folded back and held in position using a single press stud on each glove. There is some wear to the linings and loss of fleece - most notable on the left glove (see photograph). There is also a surface cut/damage to the leather on the innerside of the mitten section (see photograph). Any markings have sadly long gone, other than an owner's name. A good '+' pair of these extremely rare flying gloves. A genuine antique. Stock code GA21884.